Deciphering MS20253 Hinge Pin part numbers may seem confusing at first, but with a little background it is relatively straightforward. Here we take a concise look at how to read an MS20253 part number, which completely defines all physical attributes of each hinge pin. All MS20253 part numbers begin with the Base Number, “MS20253”. What follows after the “MS20253” defines the hinge pin. First, the Finish of the pin is specified with a single character. A “P” indicates Cadmium Plate finish (per QQ-P-416) or a “-” indicates a Passivated finish (per QQ-P-35). The next digit specifies the diameter of the hinge pin. A “1” specifies a diameter of 0.062” (1.57mm), a “2” indicates a dia. of 0.089” (2.26 mm), a “3” indicates a dia. of 0.117” (2.97mm), a “4” indicates a dia. of 0.179” (4.55mm), and finally a “5” indicates a dia. of 0.129” (3.28mm). A dash “-” always follows the digit indicating diameter. Next, the length of the MS20253 pin is given in hundredths of an Inch. For example, a length of 0.60” (15.24mm) is specified as “60”. A length of 144.00” (3657.6mm) is specified as “14400”. No decimals are used. Finally, if an “L” follows the length designation, then the pin is lubricated with Solid Film Lubricant (per MIL-L-46010). If no “L” is present- then the pin is unlubricated. MS20253P2-7200 is: Cadmium Plated Hinge Pin with a diameter of 0.089” (2.26mm), and a length of 72.00” (1828.8mm), unlubricated. MS20253-4-150 is: Passivated Hinge Pin with a diameter of 0.179” (4.55mm), and a length of 1.50” (38.1mm), unlubricated. 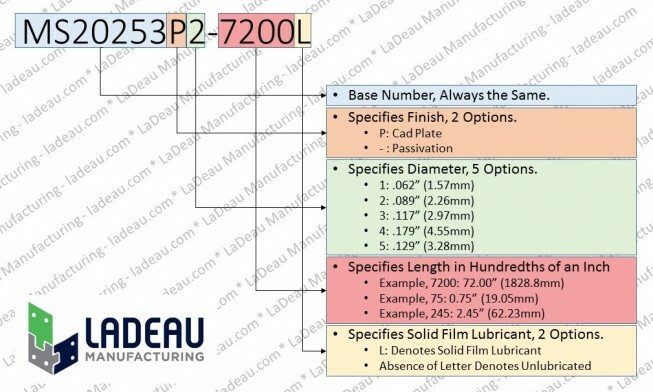 MS20253P1-88L is: Cadmium Plated Hinge Pin with a diameter of 0.062” (1.57mm), and a length of 0.88” (22.3mm), lubricated with Solid Film Lubricant. MS20253-5-12205 is: Passivated Hinge Pin with a diameter of 0.129” (3.28mm), and a length of 122.05” (3100.1mm), unlubricated.